Shaikh Muḥammad al-Muḥammad was born on Friday 15/April/1938 CE in Kirpchina. He was raised in a family of most pious Shaikhs. From early childhood he showed much interest in all aspects of religion. He loved to help and protect the weak and stand in the face of injustice and wrongdoing. People who are mistreated and wronged would often seek his help which he would generously offer. Shaikh Muḥammad al-Muḥammad is a descendant of Prophet Muḥammad (PBUH). This is his full genealogy: He is son of Sayyid ʿAbd al-Karīm al‑Kasnazān, son of Sayyid ʿAbd al-Qādir al‑Kasnazān, son of Sayyid ʿAbd al-Karīm Shāh al‑Kasnazān, son of Sayyid Ḥussein, son of Sayyid Ḥasan, son of Sayyid ʿAbd al‑Karīm, son of Sayyid Ismāʿīl al‑Wilyānī, son of Sayyid Muḥammad al‑Nudayhī, son of Sayyid Bābā ʿAlī al‑Wandarīna, son of Sayyid Bābā Rasūl al‑Kabīr, son of Sayyid ʿAbd as‑Sayyid aṭḥ‑Ṭḥānī, son of Sayyid ʿAbd ar‑Rasūl, son of Sayyid Qalandar, son of Sayyid ʿAbd as‑Sayyid, son of Sayyid ʿĪsā al‑Aḥdab, son of Sayyid Ḥussein, son of Sayyid Bāyazīd, son of Sayyid ʿAbd al-Karīm al‑Awwal, son of Sayyid ʿĪsā al‑Barazanjī, son of Sayyid Bābā ʿAlī al‑Hamadānī, son of Sayyid Yūsuf al‑Hamadānī, son of Sayyid Muḥammad al‑Manṣūr, son of Sayyid ʿAbd al‑ʿAzīz, son of Sayyid ʿAbd Allah, son of Sayyid Ismāʿīl al‑Muḥaddaṭḥ, son of Imām Mūsā al‑Kādhim, son of Imām Jaʿfar aṣ‑Ṣādiq, son of Imām Muḥammad al‑Bāqir, son of Imām ʿAlī Zayn al‑ʿĀbidīn, son of Imām al‑Ḥussein, son of Imām ʿAlî bin Abī Ṭālib and Sayyida Fāṭima az‑Zahrā’ the daughter of Prophet Muḥammad (PBUH). The origin of the Shaikhs of Ṭarīqa Kasnazaniyya can be traced to the Arabian peninsula, the land of their great grandfather (PBUH). One of the forefathers of the Shaikhs of Ṭarīqa Kasnazāniyya, Sayyid Yūsuf, who was contemporary to Shaikh ʿAbd al-Qādir al‑Gaylānī, immigrated from the Arabian peninsula heading north, escaping the campaigns of persecution against the descendants of the Prophet (PBUH). Sayyid Yūsuf lived in Baghdad for some time before leaving to settle in Hamadān, Iran, hence his title “al‑Hamadānī (of Hamadān)”. The deep and versatile knowledge of this noble Sufi Shaikh attracted to him all kinds of people who were in search of knowledge. He was also called “Shihāb ad‑Dīn (the heavenly light of religion)”. Two of Sayyid Yūsuf al‑Hamadānī’s grandsons, Mūsā and ʿĪsā, moved to live in a village called Barzinja in the city of Sulaymāniyyah in northern Iraq where Shaikh ʿAbd al-Karīm Shāh al‑Kasnazān was born centuries later. Shortly before the departure of Shaikh ʿAbd al-Karīm from this world, Shaikh Muḥammad al-Muḥammad al‑Kasnazan saw Prophet Muḥammad (PBUH) in a visionary dream. The Prophet (PBUH) was sitting on the floor, resting his back against the shrine of Shaikh Ḥussein al‑Kasnazān, facing the Qibla. Shaikh Muḥammad moved quickly towards his great grandfather (PBUH), kneeled down in front of him, and with all humility and respect stretched out his hand and put it in the hand of the Prophet (PBUH). Shaikh Muḥammad says that at that moment of physical and spiritual meeting with the Prophet (PBUH) he had a unique feeling of pleasure that is beyond description. He aso realized that Shaikh ʿAbd al-Karīm will depart soon to the spiritual world and that this was the Prophet (PBUH) appointing him as the heir of Shaikh ʿAbd al-Karīm as the Master of Ṭarīqa. Following in the footsteps of his predecessors, Shaikh Muḥammad al-Muḥammad al-Kasnazān has dedicated huge efforts to guiding people to the right path to Allah and spreading the Sufi message, the message of Prophet Muḥammad (PBUH). He so often cites the Prophetic saying: “Irshād (guiding others) is the greatest worshipping act in Islam.” As a result for the enormous efforts of Shaikh Muḥammad al-Muḥammad al‑Kasnazān, the light of Ṭarīqa spread everywhere and more and more people accepted the spiritual way of the Prophet (PBUH). Shaikh Muḥammad built many takyas inside and outside Iraq so that the dervishes can gather to perform dhikr, remembering Allah. In 1982, the central takya of Ṭarīqa Kasnazaniyya which Shaikh Muḥammad built in Baghdad was completed. Adjacent to the takya is the house in which Shaikh Muḥammad al-Muḥammad and his family lived. He was the first Shaikh of Ṭarīqa Kasnazaniyya to move to Baghdad where he used to lead daily dhikr sessions in the takya. From his young age, Shaikh Muḥammad al-Muḥammad was a keen seeker of knowledge. He studied various Islamic sciences at the hands of famous Shaikhs at the school of his grandfather in Kirpchina. He continued to develop his knowledge through reading and personal study. For seventeen years, he used to visit the main libraries in Baghdad, going in the morning and staying until the library closes in the afternoon. He has also developed a personal library of thousands of books and manuscripts. Shaikh Muḥammad al-Muḥammad is also a prolific author, having published a number of books, including a unique 24-volume encyclopaedia of Sufism called “The encyclopaedia of the Kasnazān.” At any point, he has several books in development. The Shaikh is a strong supporter of science and has always believed that science and Sufism are both critically needed for the best of mankind. It is in this spirit that he founded a university that offer degrees in various religions and non-religious disciplines. 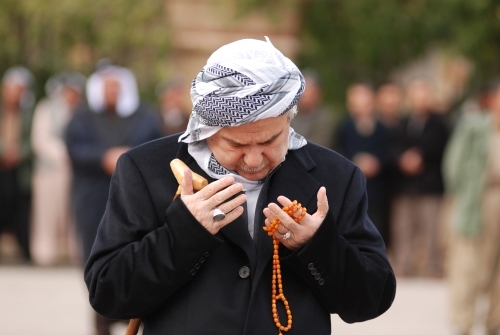 He also formed “The Central Council of the Sufi Ṭarīqas in Iraq.” In 1994 he founded “The International Centre of Sufism and Spiritual Studies.” The centre focuses on studying the cases of instant healing in a certain type of karāmas of Ṭarīqa Kasnazāniyya known as “dirbasha,” which prove the existence of Allah, and comparing them with parapsychological phenomena. He introduced a new Islamic calender, called “The Muhammadi Calendar,” that dates relative to the year of birth of the Prophet (PBUH) in celebration of the sacred birth. He also launched the internet website of Ṭarīqa Kasnazaniyya www.kasnazan.com and the general international website on Sufism of www.islamic-sufism.com. Shaikh Muḥammad al-Muḥammad has entered three retreats. His first retreat as the Shaikh of Ṭarīqa was six months after succeeding Shaikh ʿAbd al-Karīm on 26th/July/1978. He was accompanied by a number of dervishes and Khalīfas each of whom worshipped in his own retreat. His second retreat was in 1979 in which he took with him double the number of dervishes that he had in the first retreat, and his third retreat was in 1980.